Although there is no doubt that small towns festivities from the past lived more intensely than nowadays, mainly due to the current saturation of leisure, these celebrations still exist. although few of them maintain an impressive splendor. Some of the most attractive could be San Anton from Cuerres in January, San Jose from Sebreñu in March, Fatima´s Virgin from Toriellu, San Lorenzo and Cuerres Cheese Fair, in August, Assumption´s Virgin (also called “La Velilla”) of Meluerda, also in August,and or “The Virgin of Hope” located in Collera in September. In almost all cases festivals are seen as a resurgence of genuine folk elements as the regional costume or “El Ramu”/ Easter Flower-Bouquet procession with the symbol of the village, to be auctioned after the show. " El Ramu" is exactly a pyramid decked with laurel and bread rusks. That refers to the ancient offerings to the deity, later assimilated by Christianity. The Fish Party in Tereñes celebrated in August is also a very important one. In February or March, there is Carnival, already in the early twentieth century was famous in Asturias. After prohibition by Franco, start once again to be celebrated in a tent placed in the Plaza Nueva in the center of town. The most important events are the costume contest and the next day, trial and sardine´s funeral . At Easter is especially celebrated in town Good Friday, since that day, coinciding with low tide, is held on Santa Marina´s beach a spectacular horse race. At night takes place in spring a solemn Via Crucis along the fishing pier, in the light of the illuminated crosses. In June, the night of San Juan in San Juan´s meadow. Although in the past it was held in the neighborhoods of El Portiellu and La Cuesta. Today the party is a night in the open air field, close to Sella´s river, while people are dancing and singing. Paella and grilled meat are served around a giant bonfire . In July, Guia´s Virgin, patroness of seafarers. A week before starting a novena in Guide´s Virgin Chapel, that evening a procession with the Virgin´s picture flying between discharges and Rula´s Bell to the parish church. Accompanied by thebagpipes band and the local traditional dance group Arcos. The big day has a procession of boats showed in the bay when tide permits. The festival is celebrated by the rula. Jazz days are also held in this month in Ribadesella, whose concerts, are held at night in the Plaza de María Cristina for free. 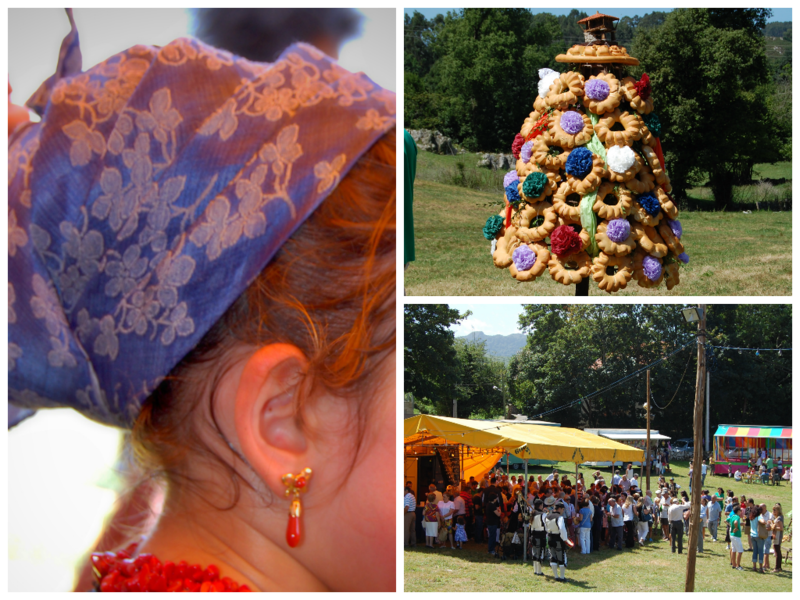 In August, Sella´s celebration , the most important celebration, is explained in a separated chapter. Santa Marina, which was once held on the beach and there were going by boat to his hermitage, evoking the ancient saleas . It was the feast of the tourist, but today is a celebration for everyone and is celebrated similar to Guide´s festivity with maritime procession and festival in Plaza Nueva. Classical music oncertsre also held in August ,in Cuevona. They take place in the auditorium where the amazing and natural Ardines cave is located . In September, San Miguel in El Cobayu is a working class neighborhood of the town from 1968. It is a festival that lasts some days and includes a popular Espicha, Asturian procession with costumes, mass campaign and children attractions. Ribadesella´s most genuine expression of folklore´s Danza by Arcos takes place. A solemn ritual dancing and dating back to the times that was danced by local fishermen as thanksgiving for hunting a whale. Its main mission was to accompany Rosario´s Virgin, in October, and later Guide´s Virgin in July. Costume consists of shirt and white trousers, blue belt , blue skirt for girls , but once, when only men danced the sea, consisting of shirt and white pants with turban and red sash . They dance is accompanied by a drum, and current figures, which are formed on the heads intertwined blue and white bows. Identified Ribadesella´s colors are the tunnel , the permission and apple. In recent years, maintenance has been linked to the Valdes family, and has recently been restored by the Sports and Cultural Society Ribadesella. A nowadays folk Gaites Band is composed by a large number of pipers and drummers from the village. They offer a superb musical show and style, and have already taken his art beyond our borders.